Living in the Pacific Northwest we become accustomed to certain things: coffee shops on every corner, farmer’s markets, artisanal cheeses, local beer and wine and one time a year amazing wild Alaskan salmon. My whole family waits all year for that window where wild Alaskan salmon comes fresh to our local markets. It is truly a fish in a league of its own. From the end of July through September you will experience some of the best fish there is to offer. Fish isn’t always the cheapest protein to buy, it gets especially expensive when you’re feeding a family of five. I decided that I would learn to cook a WHOLE fish versus buying fillets, which is generally half the price. I know the butcher would fillet it for me but I was up for the challenge and I know that cooking whole fish is a completely different level. 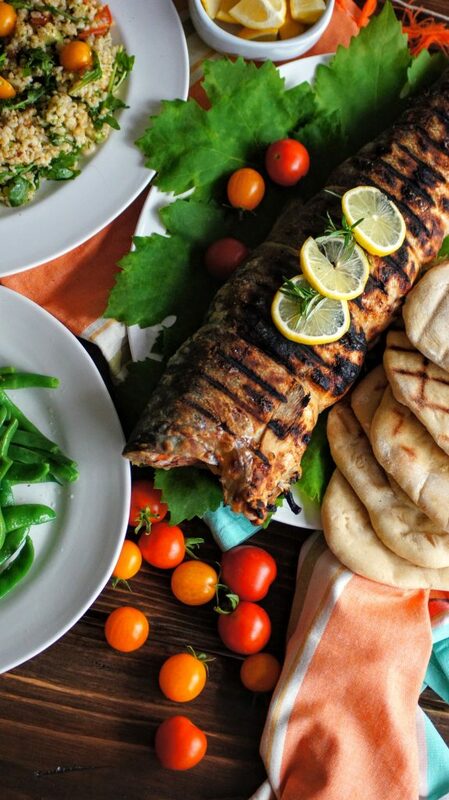 Since the salmon is available only in the summer months, grilling it is the most logical way. I know what you’re thinking, it’s going to be too hard, what if I mess it up?? I promise it’s much easier that it appears and you’ll end up with so much fish that you’ll have extra to top salads, make salmon cakes and more! It’s worth it! I’ve grilled salmon up to 4-5 pounds. This guy was only about 3 pounds and was just right for the family and provided us some leftovers as well. I work on a large sheetpan to prep it for the grill, it’s a large surface and makes for an easy work space. First thing you’ll want to do is pat the fish dry using paper towels both inside the cavity and out. Get it as dry as possible then liberally salt the inside and outside with kosher salt. I just sprinkle from a small dish without measurement. This will help to flavor the inside as well as release moisture. 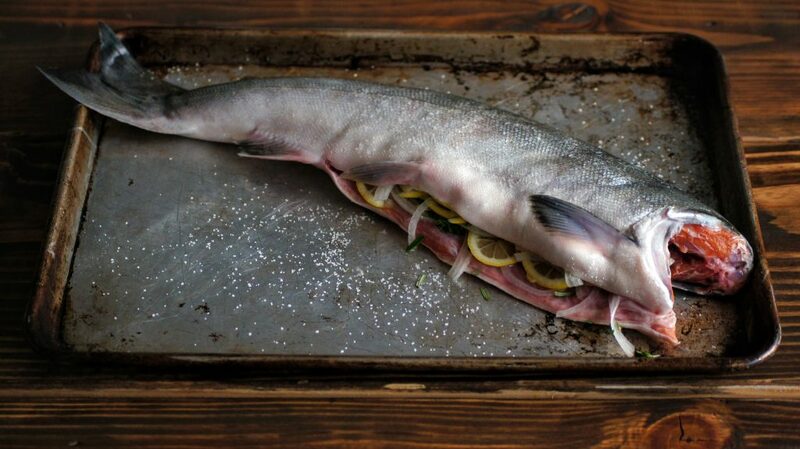 Next, you’ll want to stuff the cavity of the fish with whatever aromatics you like. I always include lemon slices, rosemary and thyme, I decided to add some thinly sliced onions this time as well. Whatever flavor profile you like, go for it! If you don’t have fresh herbs, dried herbs are fine. I salt a bit more and drizzle a bit of olive oil. The next thing you’ll need is butcher twine. 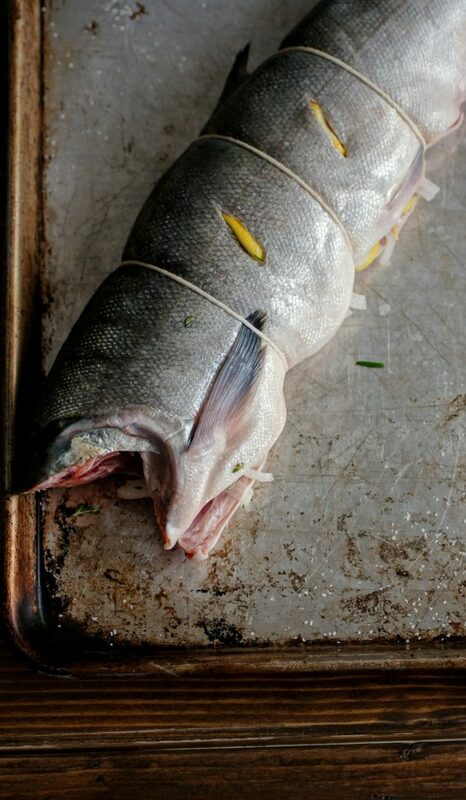 We’re going to wrap the fish up so all those good aromatics don’t fall out! 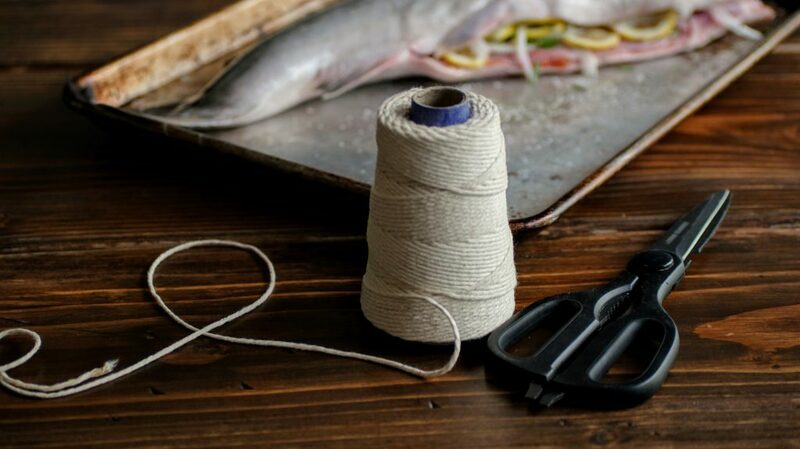 Cut 3-4 long strands of string to wrap your fish. Slide one of the strands under the fish toward the front, tie snugly. Repeat with the last 2-3 strands in the middle and the back of the fish. Trim the excess string. After the fish is nice and snug, all the aromatics are in there tight, make a few slits on each side of the thickest part of the fish. Insert some slivers of lemon. 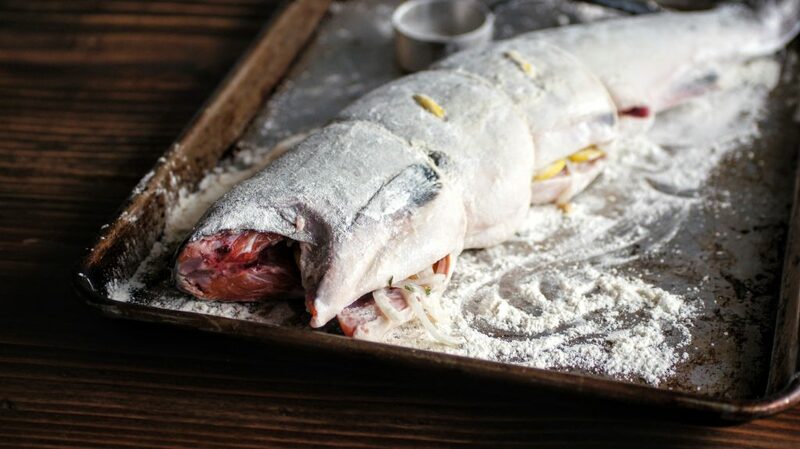 Before you get this guy all oiled up, generously flour the entire fish. Get the grill nice and hot on medium-high, about 400 degrees (if your grill has a temperature gauge, it’s super helpful!) Oil the grates of the grill until they are nice and shiny. You’ll also want to liberally oil both side of the fish. 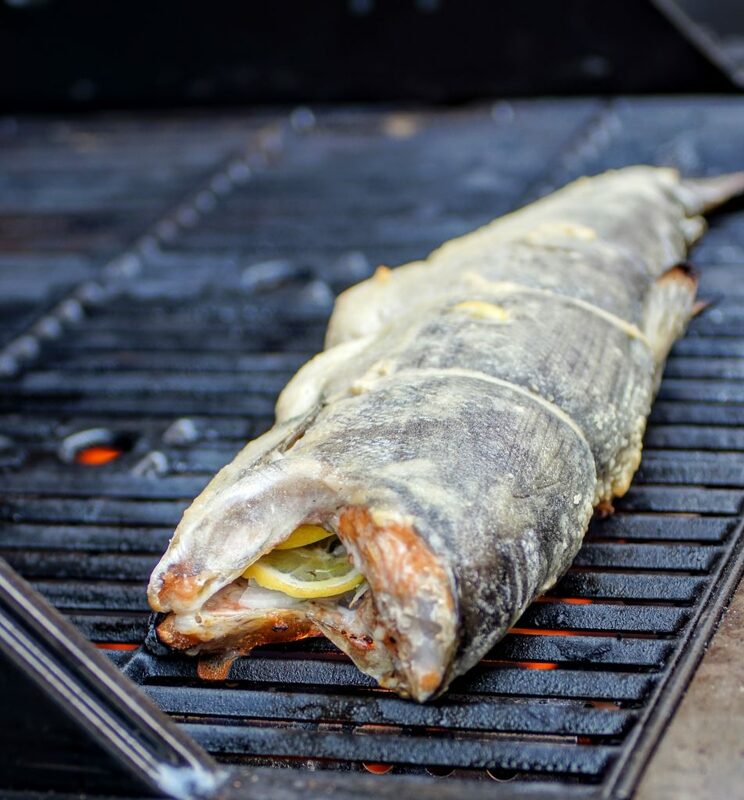 Be sure you have enough space to lay the fish on your grill grates and also enough room to flip when it’s time. I tend to lay in the front of the grill to start and flip toward the back. The fish will cook about 10 minutes on each side (about 10 minutes each inch thickness of fish). 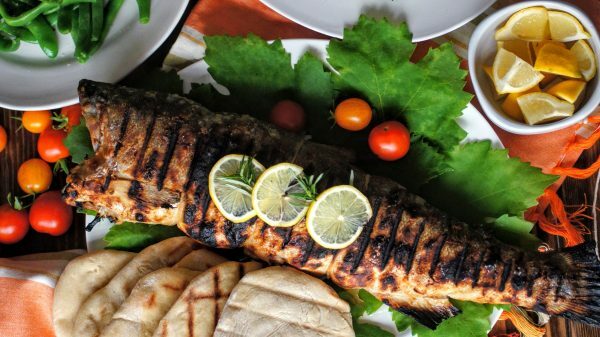 Once the fish has cooked on one side, with a large spatula, carefully flip the fish over. The fish should easily flip and not stick to the grate. You can surely cover the tail with some foil so it doesn’t burn…as you can see I didn’t but eh, we’re not eating the tail so it was just fine! Cook for another 8-10 minutes then remove carefully to a large platter. Snip the strings off and enjoy with your favorite side dishes!!! Begin by patting the fish dry using papertowels, both inside and out. Generously salt the entire fish with kosher salt, inside and out. Stuff the cavity of the fish with lemons, onions and herbs. Give a sprinkle of additional salt and drizzle of olive oil. Cut 3-4 strands of butcher twine. 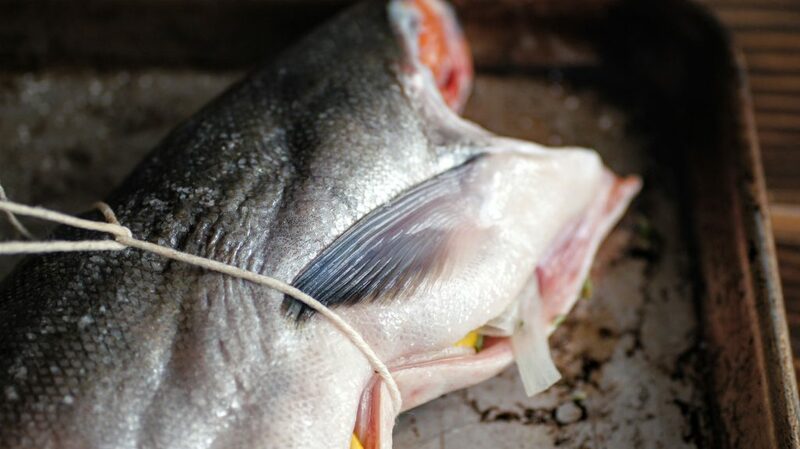 Begin by sliding once strand under the fish and tie tightly. Repeat with the other 2-3 strands until the aromatics are snug. Trim any excess string. Cut 2 slits on each side of the fish and insert a small slice of lemon. Generously flour the entire fish. Then generously oil both sides. Light grill and set to medium-high (about 400 degrees). Coat the grill grates with additional oil until they are shiny. Place fish down toward front of the grill and cook for about 10 minutes (each inch of fish needs 10 minutes). After 10 minutes, the fish should flip easily. Flip and cook for another 8-10 minutes. Remove from grill, snip string and enjoy! The center spine of bones should come out easily. Section out fillets and squeeze additional lemon or any side sauce with the fish. Leftover fish is great to use in salads or to make salmon cakes. Use within 3 days.